When I have guests over for a south Indian meal, I usually serve this ginger and lime laced rasam as an appetizer and as a drink. This drink kindles the digestive fire in the stomach, arouses a healthy appetite and opens up the taste buds to experience the other treats on offer. 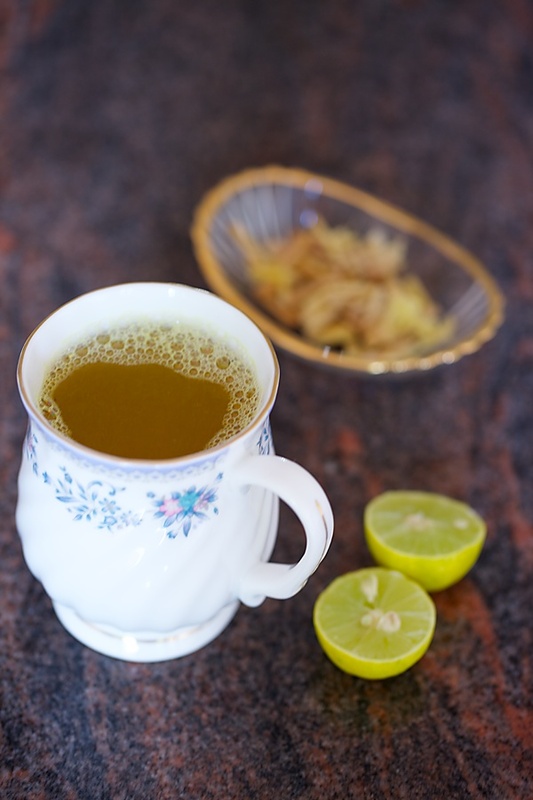 And when the weather changes to rainy season or chilly winters, this ginger and lime drink is a surefire way to soothe a sore throat, a nasal congestion or a nagging cold related headache, all symptoms usually manifesting themselves during seasonal changes. When it was raining outside and I found myself with a headache which was just about to start and was threatening to leave me indisposed, I made myself this rasam, spiked with the medicinal and curative properties of ginger and lime and relished every sip with the accompanying soothing sensation. With simple ingredients, easy techniques and absolutely no fat in it, this traditional Indian soup is an important formula in my repertoire of recipes. Ginger has been used as a spice and medicine in many herbal traditions for thousands of years to cure a number of ailments. 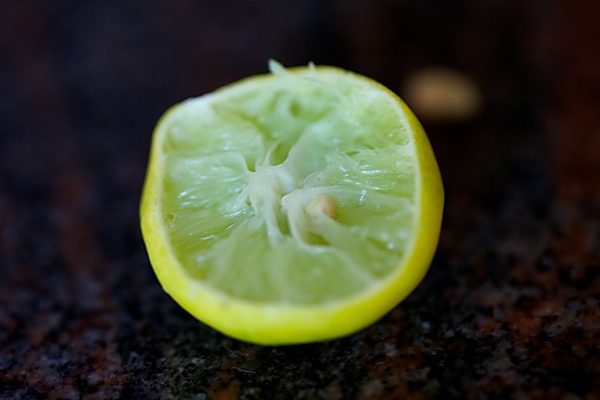 And the miraculous, healthful properties of lime are widely recognized too. 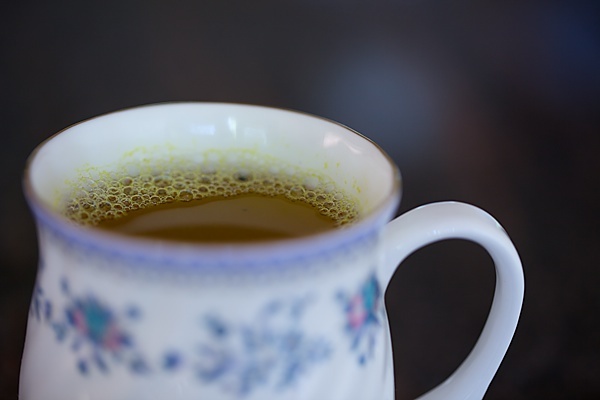 Ginger and lime in this fatless soup, provide a healing and tasteful touch making it a soothing drink which once had cannot be easily forgotten. 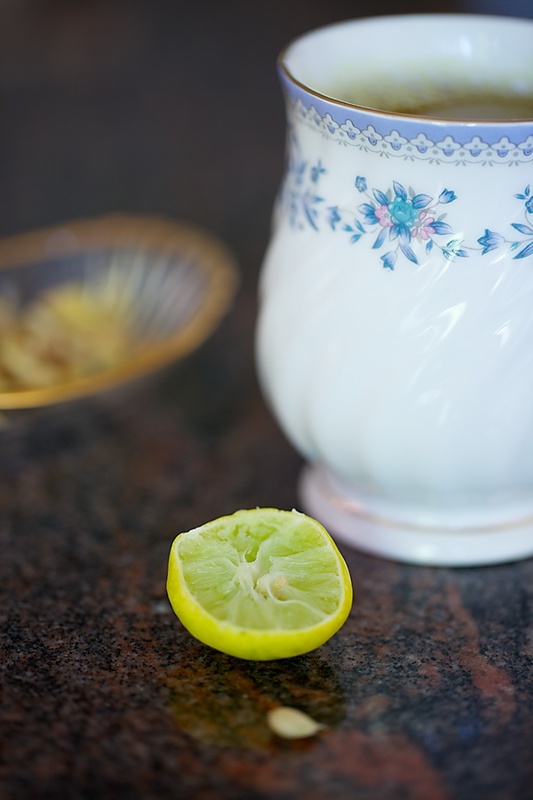 Serve this drink with extra pieces of cut lime and thinly sliced ginger for guests to help themselves. Wash the dal well and soak in water for 15 to 30 minutes. Assemble the ginger, pepper, cumin, chili, turmeric and asafetida and grind to a fine paste in a grinder or a mortar and pestle. Place the dal, the ground paste, water and salt and pressure cook for 3 to 4 whistles or until done. Alternatively cook in a saucepan until done, about 45 to 50 minutes. Turn off the heat, put in the lime juice and serve hot. Note:- Make sure you stir in the lime juice after you turn off the heat. 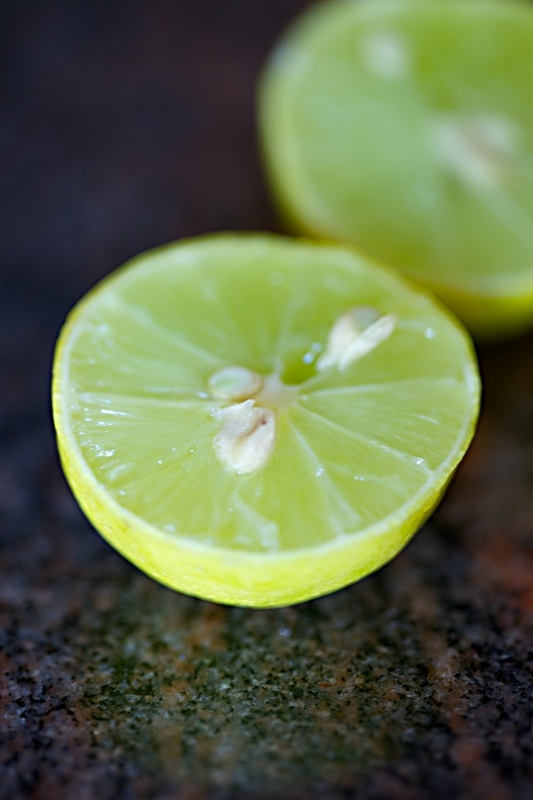 Heating the soup with the lime in it will destroy most of the vitamin C.
Hi Anu, looks very enticing. Is arhar dal same as toor dal? Just what I was looking for. This was much needed. Thanks for sharing. I am gonna treat my taste buds soon. Yes Lakshmi it is the same. Cakes in Delhi: Hope you enjoy it! LOved the simplicity of the rasam..my mom makes something similar and adds hing/asafoetida too..
Shruti: I add asafetida too. Thanks for making me realize the omission. Perfect for the winter here! Thanks. Every rasam is rasam only if it has asfoetida for me. I make it similarly but season it at the end with mustard and jeera and curry leaves popped in a small tsp of ghee. Oh the aroma when it hits the frothy rasam…..
Shoba: Not just rasam, but a lot of dishes are unimaginable without asafetida for me. I prefer to go without seasoning in this because I like to serve it as a drink and mustard seeds floating in the liquid can be unpleasant to most tastebuds. The seasoning ingredients go while cooking it. Why no garlic in your recipe ? Can this recipe be given to 11 months baby? is it fit to use for them? mine is suffering from a little cold these days..and want to avoid medications. 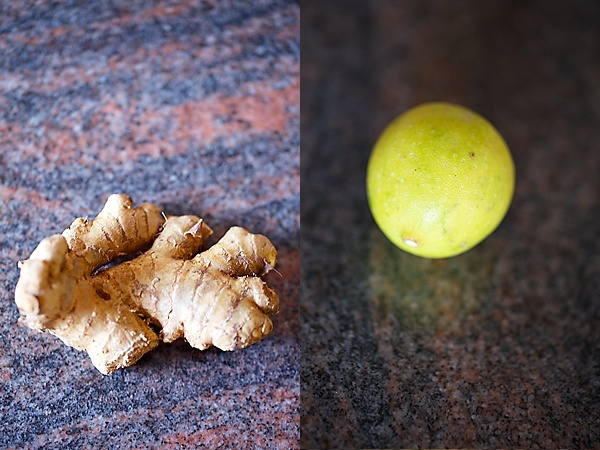 I normally make plain lime rasam but the addition of ginger sounds interesting! Excellent soup goes well with all seasons love the click looks very tempting . Garima: Ofcourse! Adjust your spice preferences though. Can I ask you which mixer grinder do you use or suggest to grind small quantities of spices to a fine paste using less water? Especially for soups like this or tambli or Huli, thai curries etc..
Ashwini: Any small jar of a good brand should do. I use Philips, but keep changing every 3 to 4 years. I saw this recipe featured in Rajshree food channel. Loved seeing you cook in your spectacular kitchen. One question – i saw the stone mortar pestle that you used for this. I too have a very similar one which my aunt bought for me. But it is still not seasoned and not yet suitable for use. How do you season that? is there a good and quick way to get rid of all the dirt/small stone particles? sandhya: You can scrub your mortar and pestle with a paste made with rice flour and water. You need to do this a few times until you get a clean surface. Hope this helps! Ronak- Thank you for your good wishes. God willing, it can happen.